The Line Outside the Wells Fargo Pavilion for the H-E-B Feast of Sharing. Yantis Green Photo. Diners Enjoying Turkey & Dressing at 2018 H-E-B Feast of Sharing. Yantis Green Photo. Entertainment & Booths at 2018 H-E-B Feast of Sharing. Yantis Green Photo. SAN ANGELO, TX -- The 22nd annual H-E-B Feast of Sharing at the Wells Fargo Pavilion in San Angelo was packed Sunday as organizers planned to feed 5,000. The meals served from 11 a.m. to 3 p.m. included sliced turkey, cornbread dressing, all the trimmings and pumpkin pie. Here's a video from Sunday. 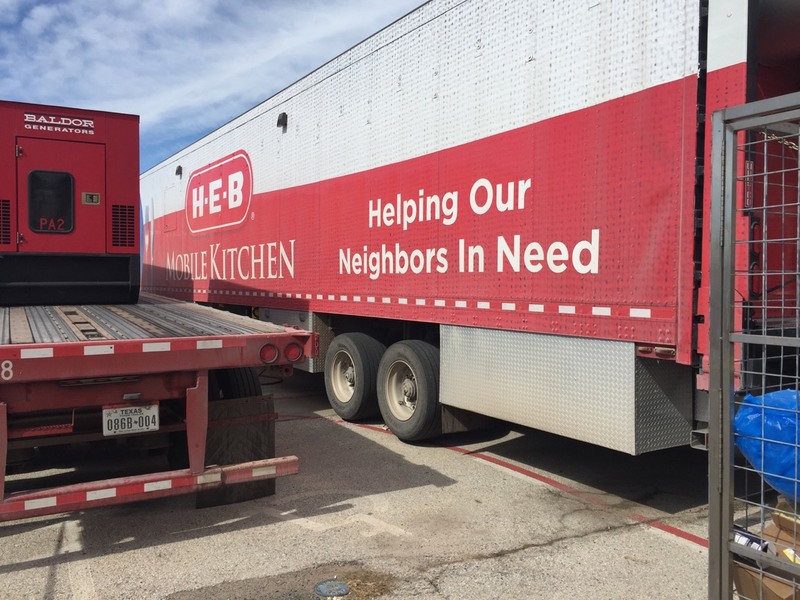 Founded in 1989, the H-E-B Feast of Sharing dinners are an important part of the H-E-B Food Bank Assistance Program, which works year-round to prevent hunger in Texas and Mexico. The annual holiday feast includes more than 250,000 meals served during 30 dinners held throughout Texas and Mexico. According to the H-E-B website, the Texas grocery store chain holds Feast of Sharing events in 24 cities across Texas. The average Feast of Sharing holiday dinner serves 3,000 pounds of sliced turkey, 2,500 pounds of cornbread dressing, 750 pumpkin pies, 380 gallons of mashed potatoes, and 140 gallons of turkey gravy. How do you prepare that much food? You bring your own kitchen. The photo below shows the mobile kitchen set up outside the Wells Fargo Pavilion. Organizers say they prepared the food on Saturday, slicing the turkey and preparing the rest of the food. The ovens in the mobile kitchen worked overtime to prepare the meals Sunday morning. An army of volunteers (literally) included soldiers from goodfellow delivered the meals from the kitcken to the dining tables. There were representatives from the San Angelo Fire Department, the San Angelo Police Department, the Tom Green County Sheriff's Office and Texas Department of Public Safety Troopers also visited with patrons. There was also live music and a petting zoo.